Today I drove about 140 miles to Lake Powell and the Glen Canyon National Recreation Area. It was a nice drive out with some cool rock formations along the way. Just need to avoid getting stuck behind one of the ubiquitous rental RVs. Upon arrival it became clear that this way very much geared toward power boating and very little toward paddling and swimming. However, I located the boat rental place, which was unexpectedly bureaucratic and international. They had a large round counter with LCDs and people who could actually issue the boat rentals. Prior to that there was a queue and a woman at a podium answering the same questions to everyone. Yes, a Jet Ski is $300/day plus tax and fuel. Most of the customers were European (I think mostly French). When asked how much the gas would be for a nineteen foot boat for all day, the "Information" lady gave the answer I love: "I have no idea, it could be anything". Taxi companies pull this one a lot, too. Um, could it be $2? $9,000,000? Going to LAX in a cab, when asked approximately how much it would cost, my driver replied with the same "completely unknowable and beyond all estimation" response, but mentioned "we can stop at an ATM". I said, "well, I have $80 cash on me, will that be enough" to which he immediately replied "Oh yes, for sure it will not be that much. I wish!". Anyway, so when one of the polo-shirted tellers behind the round counter was ready I engaged in my boat rental. There were quite a few waivers to fill out. It really did have a very DMV feel to it. I guess this is partly due to the fact that the whole transaction was taking place in an office about a half mile from the dock. In my other boat rental experiences, it's generally right next to the boats, they take your $10 cash, give you a PFD and a paddle and point you at the dock. I asked the teller about where I should go and maybe where to swim. He took out a map and noted several interesting canyons off of the bay where the dock is. He also noted that a narrow passage to another big section of the lake was not always open, but today it was. After sufficient signatures, dates, initials, a $100 refundable deposit, and various receipts I was sent to the dock to obtain my boat. The dock was much more informal and I was quickly fitted with some gear and pointed at kayak number seven, and then the attendant left (I was still on the dock trying to figure out how to get my camera to display the time so I could be back by 5). In hindsight, the deck hand probably wanted to get out of earshot as soon as possible before I could ask any questions about where to go or what I should expect from the many powerboats on the lake. Why, because no one had mentioned the wind to me yet. So even after being out west for nine months, I apparently still have east coast preconceptions of things that are small and easily accessible. Kayaking in the east on a lake is a leisurely thing. Again, I failed to account for the scale of things out here and that there's a bigger expectation of knowing what the hell you are doing. Anyway, into the kayak I went and made my way out of the large area enclosed by a buoy net of giant bulldozer tires and out into open water. Not being a complete buffoon, I did know to head into the wind/current first, so off I went. 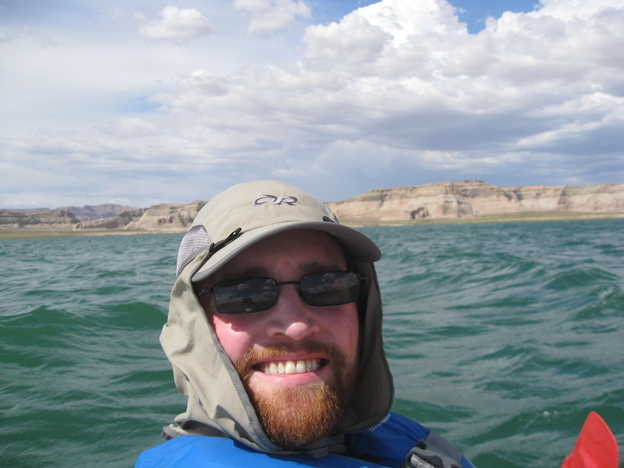 I now come to the realization that I am out in a tiny one man kayak on a monstrous body of water during monsoon season with a strong steady wind in my face. The east coast "oops" moment occurs. I think to myself, well, it's a good thing they pre-charged that $100 deposit, because I might not make it back. Water is splashing me in the face as my boat bounces into the oncoming waves. Now don't get me wrong, these aren't really waves, just choppy water, but all the same I was not expecting this. I realize that if I stop paddling for even a moment to get my bearings or enjoy the view, I lose twenty yards to the wind. So I paddle head on into the wind for about twenty minutes or so and make it maybe 150 yards from the dock, just around the first bend, staying close to the canyon wall. I look across the lake at the areas the teller had highlighted on my map and now I'm not sure if it is actually ever possible to get across on a kayak, or it was done entirely in mockery. It would be an all-day paddle for me to even come close to getting to the other side and I'd probably have to cover 5x the crow-flies distance to account for the wind. I also realize that if I stick to the canyon wall I have to head south a bit with the wind and chop on my right side. I try this for a moment and realize it is impossible. For a moment, I think my only option is to enjoy about a minute of drifting back to the dock and then turn the return the kayak twenty minutes after I rented it. I now realize why most men bring three hundred horses with them when going up against Lake Powell since nature is clearly winning this one man vs. nature contest. As I float back I see another pair of kayakers making the struggle. I rest a while and watch them. The man is able to make some progress and get out about to where I was. The woman is paddling diligently and appears to be completely stationary. Within a few minutes they turn back, but I am motivated to make another go of it. I get out past where I had first stopped and spot a couple in a 2-seater kayak on their way back. I ask if it was this windy when they left and they say no and that they had been out all day and down to the end of this bay. I power on out and get to what I consider to be a respectable distance from the dock after about ninety minutes or so. But I still haven't really gone anywhere, I just went out into the open water essentially due west from the dock. After considering the risk of water damage from chop splashing into my face, I carefully removed my camera from the water proof bag and snap a few shots and a video. Then I enjoy the easy cruise back. I would say I spent about ninety-three minutes paddling into the wind on the way out and seven minutes to get back. So I made a google map of where I think the various points of interest on my map were as drawn by the boat rental teller. These are all the blue dots. The little blue line is about the path I took. You will have to zoom in a bit to even see the kayaking route line. Not sure if the points of interest are actually reachable without the wind of it was done in pure jest. After the kayaking I went to one of the few swimming beaches and took a nap then a brief swim, then headed home to Flagstaff.